The calm waters of Bottle Creek. The high ground in the distance is Middle Caicos. This page is about organized tours to North Caicos and Middle Caicos by local businesses. 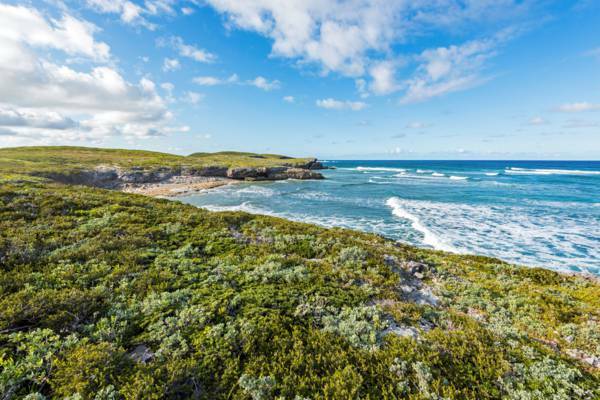 The Crossing Place Trail on Middle Caicos is one of the finest hiking areas in the country. 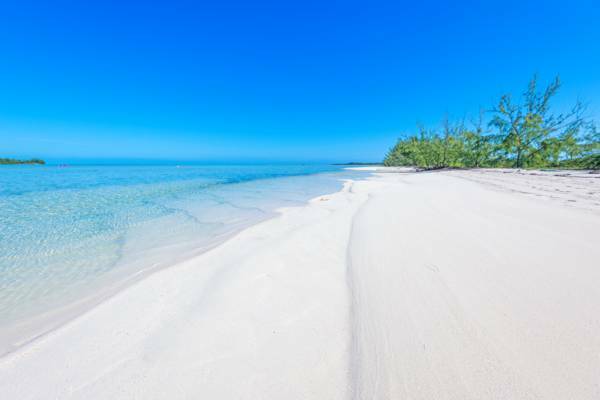 Found in the center of the Turks and Caicos, the large (compared to the other islands in the country) North Caicos and Middle Caicos offer many of the most interesting natural features in the country. 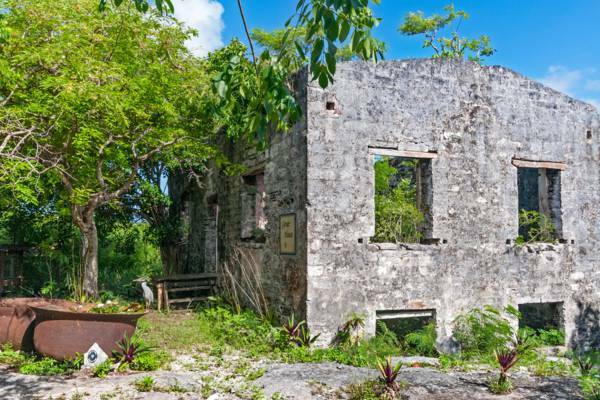 Our two garden islands offer what is a rarity in the Caribbean – islands that remain largely undeveloped and still reflect the old tropical way of life. Several businesses on Providenciales offer organized tours and day trips to North Caicos and Middle Caicos, which begins with a ferry ride from the island of Provo. There is of course bit of variance on what is offered with each package. Along with simple land tours (by car or van), cycling trips and kayak or stand up paddleboard excursions in the remote and beautiful wetlands are also popular. Wades Green Plantation on North Caicos is a popular stop on many tours. Quite a few difficult-to-access yet spectacular cays are found off of North Caicos and Middle Caicos. Uninhabited (and often part of a protected nature reserve), these locations are havens for wildlife. Bay Cay, East Bay Cay, Joe Grant Cay and Man O' War Bush are a few of the amazing and remote islands that can be visited. Excursions to North and Middle Caicos tend to be small and often private charters, so it’s typically possible to tailor-fit the day’s activities to your preferences. We advise browsing our pages on the sights, activities and beaches before contacting a tour company, so you’ll have an idea of what you’d like to see. If you’d rather keep it a bit more tranquil, a simple visit to the beach or a snorkelling spot can be arranged as well. Mudjin Harbour, Horsestable Beach, Cedar Point and Hollywood Beach are only a few of the spectacular coasts that are waiting for you to enjoy. 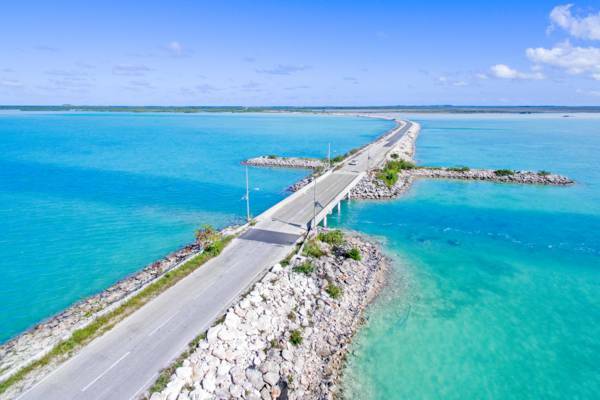 The North and Middle Caicos Causeway. 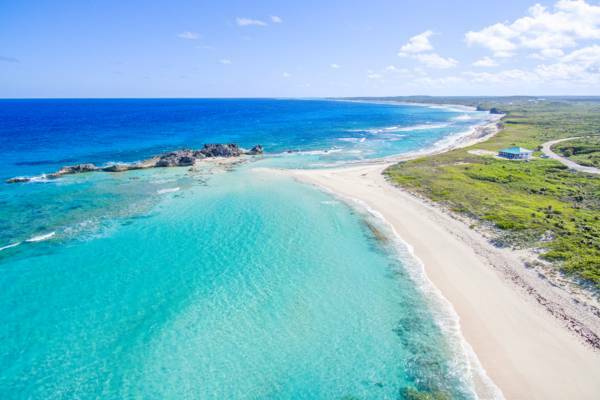 North Caicos is a 30-40 minute boat ride from Providenciales, and it can take just as long to drive from North Caicos to Middle Caicos (a causeway road connects the two islands), so organized tours and trip tend to be full day events. There’s plenty to see on both islands, so we advise spending the day. However, if your schedule doesn’t allow such a luxury, tour times can usually be adjusted accordingly. Middle Caicos is home some beautiful Karst cave systems. The largest is the famous Conch Bar Caves, a spectacular network of miles of tunnels. To protect the sensitive geology and fauna, all tours are guided. Indian Cave, an open gallery cave with circular sinkhole skylights, is another interesting stop. This feature supports papaya and ficus trees, which fight their way to the light through the openings in the limestone ceiling. Cottage Pond on North Caicos is small sinkhole pond, with an impressive depth of almost 300 feet (90m). Beach on an uninhabited cay near North Caicos. Another way to experience North and Middle Caicos is a guided bike tour. The typical route navigates the western side of North Caicos, and includes stops at Sandy Point, Kew, Wade’s Green, Cottage Pond, Flamingo Pond Overlook, Whitby, and Pumpkin Bluff. This tour covers 12-15 miles (19-24km), and is suitable for most age and endurance levels. Custom adventures to the more-remote sights and beaches are available as well. An authentic (more so than anything you can find on Providenciales) Turks and Caicos lunch is typically included on the tour. The fish and vegetables used in these dishes are often harvested the same day they prepared. 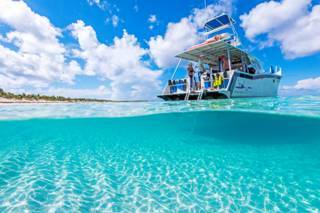 Due to the travel distances, North Caicos and Middle Caicos excursions are often full days. Drinks and snacks are typically included on tours. Dragon Island and Mudjin Harbour. The premier eco-adventure company in the Turks and Caicos, Big Blue offers several full day excursions into the wilds North and Middle Caicos. Explore by kayak, paddleboard or bike, or simply travel by van in air-conditioned comfort. Last reviewed by an editor on 16 January 2018.